Last year, BPI published a paper that analyzed the impact of the “current expected credit loss” (CECL) methodology for accounting for loan losses on banks’ regulatory capital ratios during the 2007-09 financial crisis had it been in place during that time. The paper found that CECL would have been highly procyclical, as it resulted in banks adding to their loan allowances (and constricting lending) when their support for the economy was the most needed. In short, CECL is procyclical when incorporated in non-stressed capital requirements because of the rapid shift in expectations about the deteriorating state of the economy at the onset of an economic downturn. A similar mechanism is at play in the stress tests because of the sudden change from banks’ own baseline scenarios at the beginning of the planning horizon to the Federal Reserve’s severely adverse scenario. As shown in this blog post, banks’ stressed capital requirements would have increased by a significant amount had the Federal Reserve incorporated CECL in the 2018 comprehensive capital analysis and review (CCAR) and assumed perfect foresight – that is, if banks must assume they know with certainty how the economy will perform over the next 3 years. At the end of 2018, the Federal Reserve announced that it would not account for the current expected credit loss methodology in CCAR at least until 2022. Prior to that announcement, CECL was planned to be included in the 2020 stress test cycle. Nonetheless, the Federal Reserve expects banks to incorporate CECL in their own company-run stress tests. This blog post shows that introducing CECL in CCAR would lead to a sizable increase in capital requirements if the Federal Reserve were to assume perfect foresight. 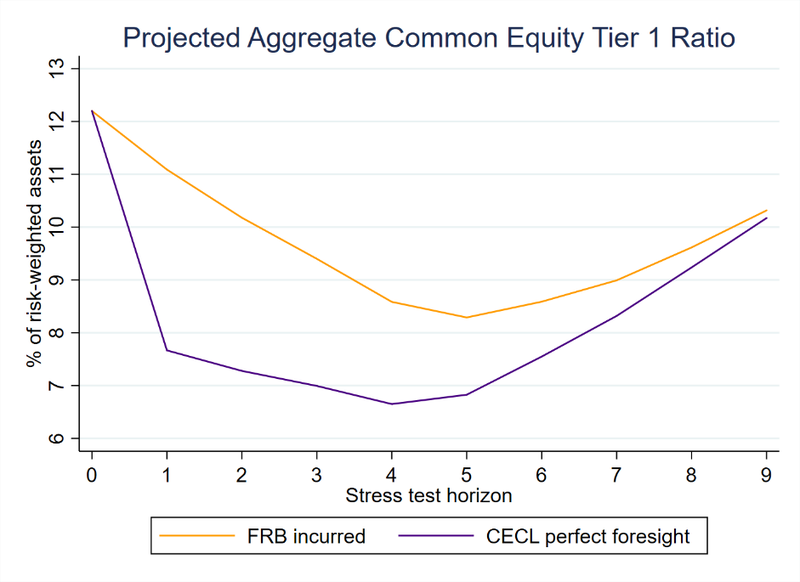 The assumption of perfect foresight pulls forward loan loss provisions under CECL and leads to a greater decline in peak-to-trough regulatory capital ratios under stress. Also, the frontloading of loan loss provisions would vary across portfolios and assumptions on scenario design and would have a greater impact on banks with a higher concentration of retail portfolios and portfolios with longer tenors. For instance, the unemployment rate peak and the house price trough, which are key drivers of expected losses on retail portfolios, are typically reached later in the scenario and, therefore, the earlier recognition of losses under CECL has a larger impact on retail portfolios. In summary, incorporating CECL in CCAR under the assumption of perfect foresight will bias the stress test results and significantly reduce the usefulness of its results. The objective of this note is to provide the magnitude of the impact of incorporating CECL in the stress tests under the assumption of perfect foresight. Note that CECL has no impact on the total amount of loan losses over the nine-quarter stress horizon; thus, the impact on banks stressed regulatory capital ratios should be minimal. However, because of the front-loading of provisions under CECL, I estimate the peak-to-trough change in the aggregate common equity tier 1 (CET1) ratio of the 35 banks that participated in the 2018 stress tests would have increased by an additional 1.6 percentage points relative to the current methodology for calculating allowances on loans. This exercise is done in three steps. First, it projects loan losses under the Federal Reserve’s 2018 severely adverse scenario. Second, it calculates CECL-based allowances and provisions using those projections. Third, it estimates the impact on the aggregate CET1 ratio using projections for pre-provision net revenue and other assumptions on corporate taxes and dividend payouts. Consistent with the Federal Reserve’s recent stress capital buffer proposal, the analysis assumes the bank’s balance sheet size and risk-weighted assets remain constant under stress and banks have to prefund four quarters of planned common stock dividends. As noted earlier, the framework used to calculate allowances on loans does not have an impact on the projections of loan losses. This section estimates loan losses under the Federal Reserve’s 2018 severely adverse scenario, which are identical under the two frameworks used to calculate loan allowances over the first thirteen quarters of the planning horizon. Under the current framework, banks don’t need to estimate loan losses beyond thirteen quarters, but they would under CECL. Covas and Nelson (2018) show how to estimate CECL-based allowances for each of the fifteen loan types available on banks’ Call Reports under a given macroeconomic scenario. This blog post uses the same approach in that paper to estimate aggregate loan losses during the first thirteen quarters and beyond (see paper for details). Naturally, BPI’s loan-loss projections under stress yield different forecasts relative to those generated using the Federal Reserve’s own models, but the main objective is to infer the impact of incorporating CECL through the lenses of supervisory models. Thus, this analysis goes one step further and makes an adjustment to loan loss projections in the blog post to match more closely the Federal Reserve’s projections for loan losses in Dodd-Frank Act stress tests (DFAST) 2018. Specifically, projected loan losses from DFAST 2013 through DFAST 2017 and those estimated using BPI’s top-down models are used to make portfolio-level adjustments to projected losses under the 2018 severely adverse scenario. The charts above compare loan losses (both in billions and as a percent of loans) obtained using BPI’s own models and the Federal Reserve’s projections under DFAST. Overall, the differences in the projections for total loans are very small, less than 1 percent (left panel). 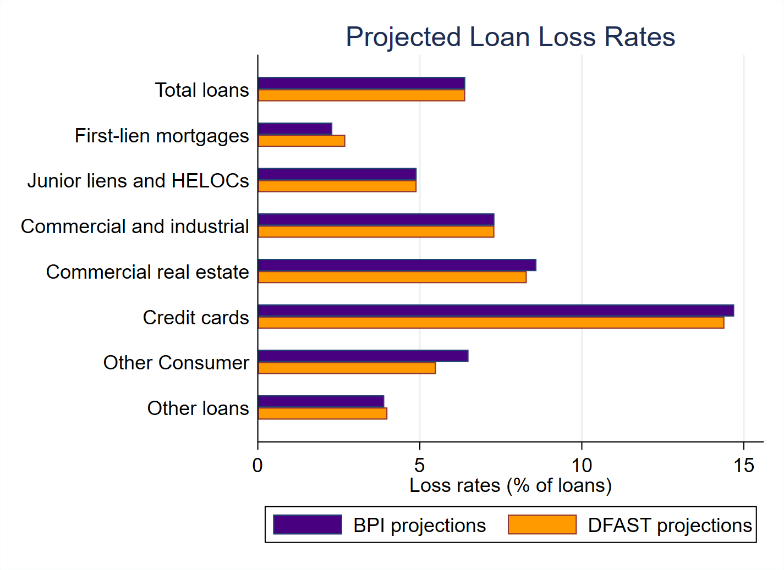 At the portfolio level, BPI’s top-down models understate loan losses for first-lien mortgage loans and overestimates loan losses for consumer loans, but the differences in projections approximately cancel each other out (right panel). 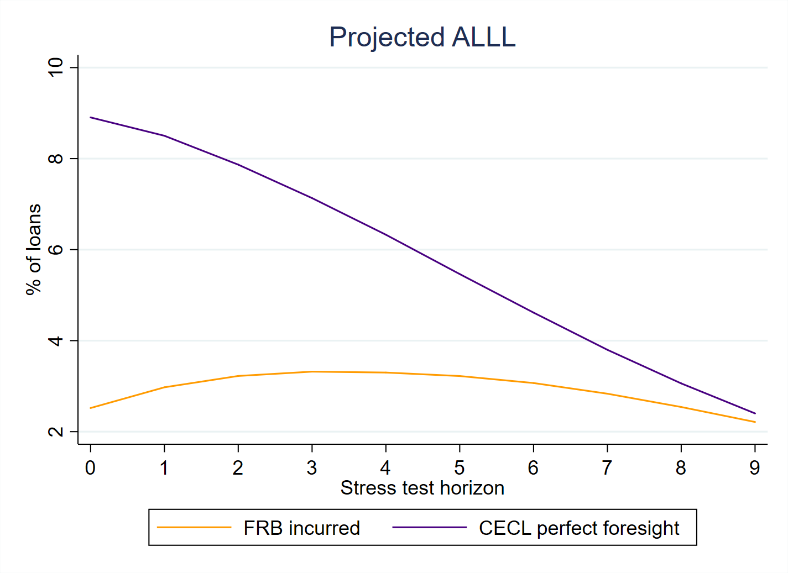 To show the problem of assuming perfect foresight under CECL in the stress tests, the charts above depict the projected allowance for loan and lease losses (ALLL, left panel) and the projected reserve build (right panel) under the current incurred framework (orange lines) and under CECL (purple lines). The projected ALLL under CECL equals the sum of lifetime losses across all loan types. Under “FRB incurred”, projected ALLL is equal to the next four quarters of net charge-offs. The chart on the left, shows ALLL in quarter zero until quarter nine, where quarter zero represents the end of period zero allowances or, equivalently, the beginning of period one allowances. As depicted in the chart, CECL-based allowances start at 8.9 percent of loans in quarter zero and decline steadily until reaching 2.4 percent in quarter nine. In contrast, allowances under FRB incurred exhibit a “hump-shaped” pattern peaking at 3.2 percent in quarter four and ending at 2.2 percent in quarter nine. The chart to the right depicts the reserve build which corresponds to the change in ALLL during a given quarter of the stress test planning horizon. As the macroeconomic scenario used to project CECL-based allowances transitions from a baseline scenario to a severely adverse scenario, the projections for lifetime losses under CECL increase approximately $500 billion in the first quarter of the stress horizon (purple line, right panel). This occurs because perfect foresight forces banks to assume that the depth and duration of the recession is known with certainty at the onset of the stress tests, which is the crux of the problem of introducing CECL into CCAR under perfect foresight. In practice, this assumption is highly unrealistic because it is impossible to accurately predict the severity of the recession at the start of an economic downturn. After the first quarter of stress, CECL-based allowances start to decline as banks release their reserves, thus the purple line in the right panel lies below zero from quarter 2 onwards. In contrast, under the FRB incurred framework for calculating allowances, the increase in reserves is much more gradual over the nine-quarter horizon and it is also almost always above the zero line. Although the assumption of perfect foresight is very extreme, it was used in the European Banking Authority and the UK stress tests this past year. In the case of the UK stress tests, the Bank of England neutralized the impact of IFRS 9 (the European analogue to CECL) on the stress tests by reducing each bank’s hurdle rates to offset the increase in provisions under IFRS 9 for each bank. In addition, the ameliorating factor in Europe is that the accounting framework does not apply lifetime estimates for most loans – in particular it limits expected losses to one year for non-defaulted loans (or stage 1 loans). Lifetime losses only apply for stage 2 and 3 loans (those close to default and defaulted loans, respectively). The Federal Reserve’s incurred loss methodology assumes incurred-based allowances should cover four-quarters-ahead of projected loan losses, which is a lot like IFRS 9. To estimate the impact on common equity capital ratios, projections for pre-provision net revenue (PPNR) are generated using the methodology in Hirtle et al (2016). For brevity, I do not describe the PPNR projections, but I also match overall revenues over the nine-quarter horizon (they were projected to be $492.3 billion in CCAR 2018). Furthermore, the analysis assumes a corporate tax rate of 21 percent and imposes a simple DFAST assumption on bank dividends. Under these assumptions, the path of the CET1 ratio under DFAST is depicted in the chart above. Under the Federal Reserve’s incurred methodology, I project a peak-to-trough decline in the CET1 ratio of 3.9 percentage points. The actual decline in DFAST 2018 was 4.4 percentage points, but my lower estimate reflects the constant balance sheet assumption and the requirement to prefund four quarters of planned common stock dividends instead of nine quarters. 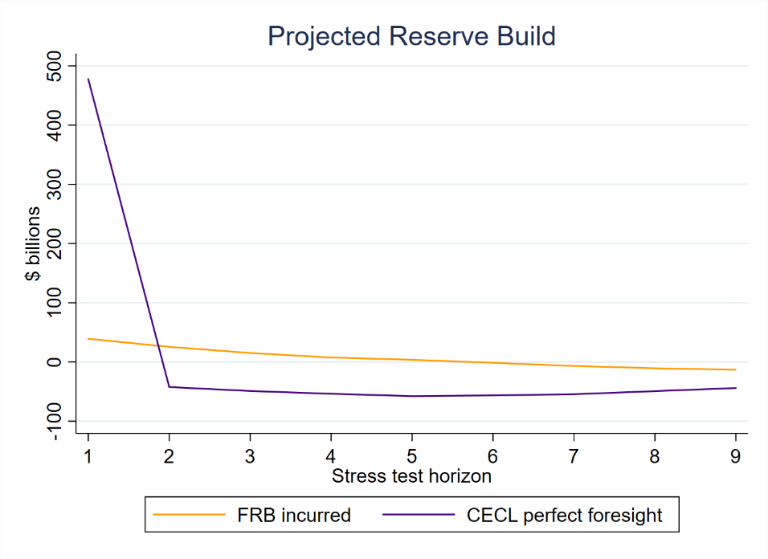 The results using CECL-based reserves under perfect foresight are represented by the purple line, which shows a peak-to-trough decline in the CET1 ratio of 5.5 percentage points, 1.6 percentage points higher than under the current incurred methodology. This is entirely driven by the assumption of perfect foresight since total losses are the same under the two frameworks for calculating allowances on loans. How should the Federal Reserve address the methodological challenges introduced by assuming perfect foresight under CECL in CCAR? First, the Federal Reserve could follow the Bank of England approach and simply not include CECL in CCAR altogether. Alternatively, it could incorporate CECL in CCAR by relaxing the perfect foresight assumption and phasing in over the nine-quarter planning horizon the CECL-induced true-up in loan allowances. However, phasing in CECL in CCAR will likely have to vary by portfolios; thus, further research is needed in this area if the overarching objective is to incorporate CECL in CCAR in a simple and transparent way. In addition, the Federal Reserve should also take into account the tighter underwriting standards applicable to new loans made during the stress scenario that replace those loans that mature during CCAR’s nine quarter planning horizon. In summary, the Federal Reserve’s decision to delay the implementation of CECL in CCAR reflects concerns that it could lead to sizable and unwarranted increases in capital requirements, especially for firms that make loans with longer tenors or banks that have a greater share of loans in retail portfolios. The mechanism by which CECL has an impact under stress is driven by the high sensitivity of loan losses to the economic outlook and the procyclical nature of CECL. The results contained in this blog post also underscore the importance of offsetting the impact of CECL for non-stressed (or spot) capital requirements. The CECL methodology for accounting for loan losses requires a bank to reserve for expected loan losses over the life of the loan at the time the loan is made. After the loan is originated, banks raise the loan loss reserve if the probability of default of the loan increases and vice-versa. The stress tests are conducted over the first nine quarters of the planning horizon, but in practice banks need to know the path of the macroeconomic variables over thirteen quarters to be able to estimate loan loss provisions. See Financial Stability Report, Bank of England, November 2018, Issue No. 44, pages 11-14. Only in CCAR is perfect foresight even possible because the Federal Reserve provides banks with thirteen quarters of information about the future that would otherwise not be known with any degree of certainty. The shape of the reserve build under CECL depends on the reasonable & supportable horizon used. The analysis in the notes uses 9 quarters which is the same as the stress-test planning horizon. They are approximately equal. There is also a problem associated with perfect foresight under the FRB incurred methodology as noted on page 69 of the DFAST 2018: Supervisory Stress Test Methodology and Results (June 2018). However, the true-up in ALLL is considerably smaller and the Federal Reserve smooths the difference into the provision projection over the nine quarters of the planning horizon. In this analysis we smoothed the true-up under the current framework equally over the nine quarters. For simplicity, I don’t model trading and counterparty losses and other losses – those are directly deducted from PPNR. Also, I assume that trading and counterparty losses are incurred in the first two quarters of the stress horizon. The assumption on taxes is extremely simple and understates the impact of incorporating CECL in CCAR under perfect foresight. Under DFAST 2018, risk-weighted assets were projected to grow under stress and also included nine-quarters of dividends. On November 28 2018, the Bank of England announced that it would adjust the bank-specific hurdle rates to offset the impact of IFRS 9 in the UK stress tests.